PPHS sophomore Kyelar Morrow (2) steals the ball in front of Tornadoes Trey McNickle (14) and Cole Steele, during the Big Blacks’ 62-45 victory on Saturday in Point Pleasant, W.Va.
Southern senior Weston Thorla hits an and-1 layup over PPHS senior Braxton Yates (24), during the Big Blacks’ 62-45 win on Saturday inside ‘The Dungeon’ in Point Pleasant, W.Va.
POINT PLEASANT, W.Va. — Momentum simply didn’t matter. 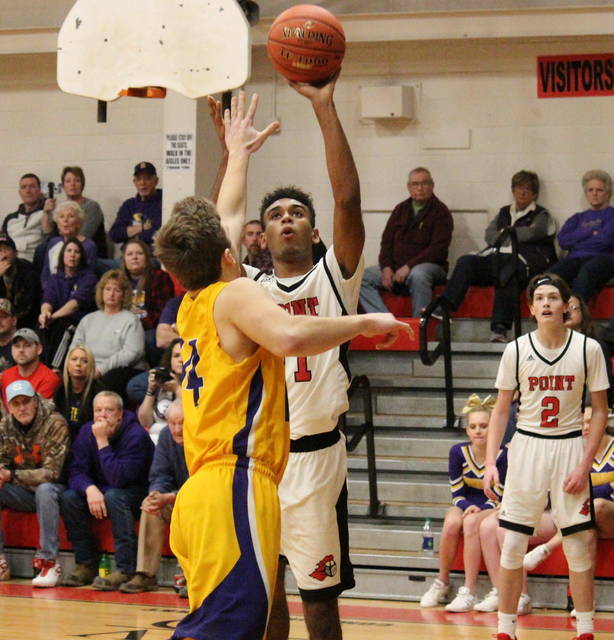 The Point Pleasant boys basketball team snapped its six-game losing skid on Saturday in ‘The Dungeon’, defeating non-conference guest Southern by a 62-45 count to end the Tornadoes’ three-game winning streak. The Big Blacks (3-12) hit a quartet of three-pointers in the opening five minutes of play, charging out to a 16-4 lead. Southern (9-8) held PPHS off the board for the last three minutes of the first quarter, and hit a trifecta to trim the hosts’ lead to 16-7. Point Pleasant opened the second quarter with a two-pointer, but the Tornadoes claimed the next 10 markers, cutting the margin to 18-17. After another PPHS bucket, Southern went on a 6-0 run and led 23-20 with 3:15 left in the half. The hosts were back in front after back-to-back field goals, but Southern scored the final three points of the half and headed into the break with a 26-24 advantage. Point Pleasant scored the first four points of the second half and never trailed again. The Tornadoes tied the game at 28 with 5:16 left in the third, but went scoreless for the next five minutes, as the Big Blacks stretched their lead to 33-28. Southern was back to within a single point with 40 seconds left in the third, but PPHS drained a three-pointer and ended the quarter with a 36-32 lead. A 9-to-2 spurt to start the finale gave the hosts a double-digit lead with 5:30 remaining. From there, Point Pleasant’s lead grew as high as 20 and never dipped below nine. 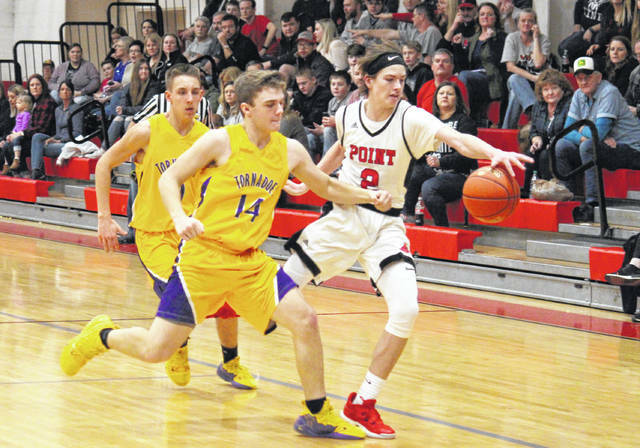 PPHS claimed eight steals, forced a dozen turnovers and sank 12-of-17 free throws in the fourth quarter, sealing the 62-45 win. Following the contest, PPHS head coach Josh Williams talked about a recent team meeting, and credited his role players and defense for the victory. “We had a meeting with them the other day, we really haven’t gotten to practice with the weather, so we just sat down and discussed our strengths and roles on this team,” said Williams. “They bought in tonight, that game was won by role players. Jovone Johnson had his thumbprint all over the game, loose balls, deflections, rebounds, offensive boards. He’s not the greatest scorer, but he knows what he’s doing, he kicked a few offensive boards out for some timely threes. Conversely, SHS head coach Jeff Caldwell felt the Tornadoes played differently on Saturday than they had in their previous seven games, of which they had won six. For the game, Point Pleasant made 19-of-50 (38 percent) field goal attempts, including 8-of-25 (32 percent) three-point tries, while Southern was 16-of-50 (32 percent) from the field, including 2-of-16 (12.5 percent) from three-point range. At the foul line, PPHS was 16-of-23 (69.6 percent) and SHS was 11-of-17 (64.7 percent). 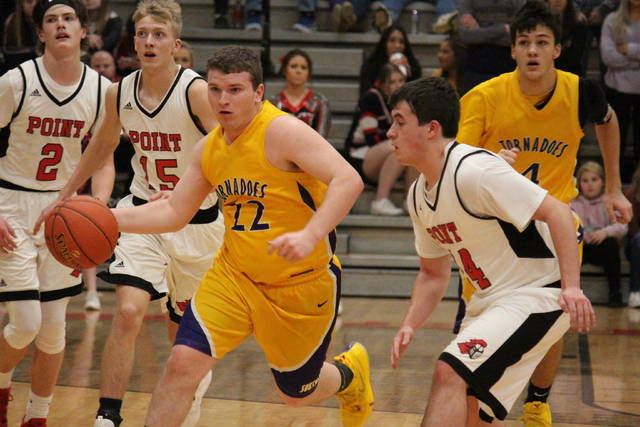 The guests won the rebounding battle by a 35-to-30 clip, including 11-to-9 on the offensive end, but the Tornadoes turned the ball over 23 times, eight more than Point Pleasant. The Big Blacks combined for 15 steals, 12 assists and one blocked shot, while the Purple and Gold came up with 12 assists, nine steals and a trio of rejections. 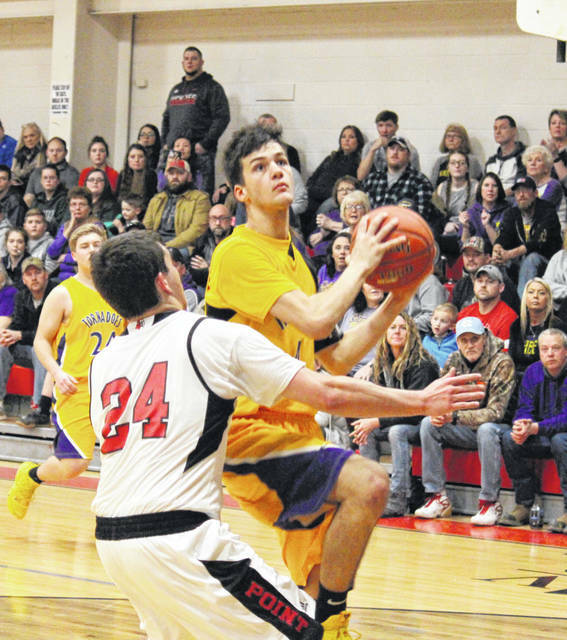 Point Pleasant was led by Hunter Bush with 26 points, featuring five triples, a pair of two-pointers and 7-of-9 free throws. Braxton Yates was next with 11 points and seven assists, followed by Kyelar Morrow with 10 points and six steals. Evan Cobb contributed nine points to the winning cause, while Trey Peck, Jovone Johnson and Bradyn Canterbury added two each, with Johnson grabbing a team-best eight rebounds. Brayden Cunningham led Southern with 11 points and eight rebounds, to go with a game-best two blocked shots. Arrow Drummer scored nine points for the guests, Weston Thorla added seven, while Cole Steele had five. Austin Baker and Jensen Anderson both scored four points, with Anderson dishing out a team-best four assists. Trey McNickle and Coltin Parker had two points apiece, with McNickle grabbing a team-high three steals, while Chase Bailey came up with one point. Next, Southern will host Trimble on Tuesday, while Point Pleasant will face Man on Wednesday afternoon in the Little General Shootout at West Virginia State University.